As communities across the United States rush to rebuild, they are racing against the clock; hurricane season begins in June and signals a return to the hottest and rainiest months of the year. Without a doubt, these months will bring another wave of storms. To prepare for and recover from increasingly strong and frequent extreme weather fueled by climate change, communities of color and families living in poverty are forced to overcome additional barriers set in place by historic discriminatory policies and practices. And, as in the aftermath of Hurricane Katrina, families with limited means, women, young children, older adults, and residents with disabilities are disproportionately affected. This column examines four pressing and long-term public health problems in Puerto Rico and the U.S. Virgin Islands, many of which draw strong parallels to problems that unfolded in Hurricane Katrina’s wake. Nearly six months after Hurricane Maria’s landfall, 11 percent of Puerto Rico and 8 percent of U.S. Virgin Islands still suffer through the longest power outage in U.S. history. Similarly, five months after Hurricane Katrina made landfall, parts of New Orleans’ Lower Ninth Ward and Lakeview still lacked power. No power means no cooling, which can present a serious health concern for young children, older adults, as well as some individuals with chronic health conditions or disabilities who may be less able to regulate their body temperatures. The lack of reliable electricity is especially devastating for Puerto Rico’s nearly 400,000 residents with a disability, some of whom need power for medical or assistive devices. To address power blackouts and shortages, residents with economic means have resorted to using costly generators. So far, the U.S. Army Corps of Engineers has installed 1,667 generators in Puerto Rico, about half of which are still in operation. But this is an imperfect solution, as most generators depend on diesel or gasoline that produces noxious gray smoke and potentially fatal carbon monoxide gas. These emissions can especially harm individuals with respiratory illnesses and even lead to carbon monoxide poisoning. To ameliorate these electricity issues, there needs to be a coordinated effort to restore power as quickly as possible to the remainder of Puerto Rico and the U.S. Virgin Islands. Federal agencies need to support local governments’ efforts to build back better, including building energy grids to withstand severe storms and providing funding and technical assistance for flexible programs that support smart rebuilding strategies. Hurricane Maria dumped up to 3 feet of rain in parts of the islands and ripped off roofs, leaving thousands of homes in Puerto Rico and the Virgin Islands reliant on temporary blue tarps for protection and allowing water to seep into buildings’ walls. As in hot and humid New Orleans, moisture trapped in walls produces mold spores that worsen asthma and lead to respiratory infections when inhaled. This is a significant challenge in Puerto Rico, where estimates of childhood asthma prior to Hurricane Maria were already as high as 30 percent. 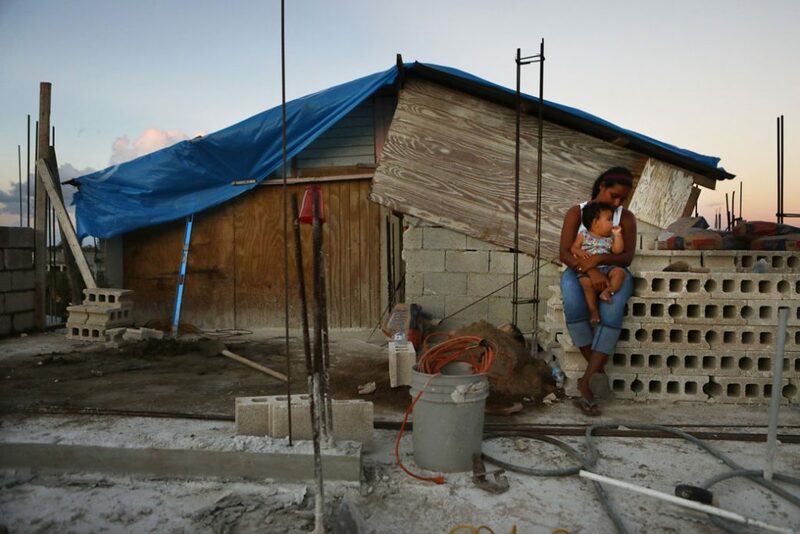 The U.S. Virgin Islands’ and Puerto Rico’s significant housing shortages before the storm have left many residents—particularly those with few economic resources and those unable to find alternative housing—exposed to black mold as they continue to occupy water-damaged dwellings. What’s more, children and older adults are especially susceptible to the harmful effects of mold spores, generator emissions, and other forms of air pollution; both children’s and older adults’ lungs are more sensitive to pollution. Children’s breathing rate is also faster than adults’, meaning they breathe in more air pollution and irritants. For people in Puerto Rico with disabilities, the impact of more than 1,500 damaged roads will result in many disabled people being unable to leave the damaged and mold-ridden homes. Puerto Rico and the U.S. Virgin Islands need federal assistance to rehabilitate and rebuild safe, affordable homes. There needs to be a fair process for distributing rebuilding funds to homeowners in a way that provides them with the necessary resources. Like Katrina’s hardest-hit states, Puerto Rico’s and the U.S. Virgin Islands’ ecosystems were already compromised by Superfund sites and landfills containing highly corrosive and caustic waste. Similar to Louisiana, Puerto Rican communities near these toxic chemical sites have long been closely monitored by public health practitioners due to their disparities in cancer, reproductive health, and chronic health conditions such as diabetes and heart disease. Vieques residents have long maintained that one of the primary sources of their illnesses and poorer health outcomes is the 2 million pounds of hazardous and carcinogenic waste—including the infamous herbicide Agent Orange and depleted uranium—from more than six decades of military firing and bombing exercises. Additionally, roughly 300,000 tons of coal ash annually generated from a privately owned coal-burning power plant continue to contaminate neighboring communities’ soil and water sources with highly harmful heavy metals such as arsenic and beryllium—a practice that will likely worsen, given the Environmental Protection Agency’s recent decision to weaken coal ash regulations. Researchers continue to monitor the extent to which hurricanes Irma and Maria’s strong winds, torrential rain, and fast-moving floodwaters, effectively dispersed these toxicants across Puerto Rico—likely worsening the existing effects of pollutants. People with less robust immune systems, many of whom are children and seniors, suffer the most from this contamination. Additionally, children’s typical behavior, such as putting objects in their mouths, make them more likely to come in contact with toxicants and other hygiene-related health issues born from contaminated water and soil, such as lead poisoning, diarrheal diseases, and leptospirosis. Six months after the storm, residents of Puerto Rico and the Virgin Islands are still likely to interact with pollutants. The U.S. Virgin Islands are still struggling to dispose of storm debris and trash containing hazardous medical waste as well as other materials that increase the likelihood of contact with the above health risks. As the Center for American Progress has previously recommended, immediate and sustained action should be taken to prioritize disaster recovery programs that help rebuild and fortify particularly vulnerable communities. In addition to prioritizing efforts in areas located within 5 miles of toxic waste sites, federally supported and locally directed environmental risk assessments should be conducted throughout the recovery period to identify proximate contaminant threats and potential immediate and long-term impacts to residents’ health and ecosystem. Lastly, the government should hold industry actors more accountable for the pollution they create. Communities are still dealing with the trauma of losing their homes and saying goodbye to scores of loved ones—including the unknown number of people who have died because of the hurricanes and the hundreds of thousands leaving the islands for the mainland. The resulting stress can have significant mental health consequences, particularly for individuals who have a history of mental health issues. Data from Puerto Rico’s Commission for Suicide Prevention demonstrate that, since Hurricane Maria made landfall, a serious mental health crisis has been unfolding in Puerto Rico. Suicide crisis hotlines reported a 246 percent increase in suicide attempts from November 2017 through January 2018, compared with the numbers from same time last year. But suicide is only the tip of the iceberg when it comes to mental health. Studies find a 5 percent to 15 percent increase in the incidence of mental health disabilities such as post-traumatic stress disorder (PTSD) among disaster survivors. Significantly, children and youth are more likely than adults to experience severe impairments such as PTSD, depression, and anxiety after a disaster. The aftermath of Hurricane Katrina bears out this pattern: 37 percent of New Orleans’ children who lived through the storm received a mental health diagnosis afterward, compared with 17 percent of adults. In the general population, the estimated prevalence rate of such problems is 1 percent to 3 percent. Now that Congress has authorized funding for behavioral health treatment and crisis counseling for hurricane survivors, federal agencies must provide technical assistance to grantees. For example, humanitarian agency leaders with disaster experience highly endorse re-establishing schools. However, educators and front-line staff report needing additional training on how to deliver trauma-informed care, particularly in school settings. Fortunately, the disability community, as well as some cities and states, already have this expertise. Congress should increase funding for organizations—such as states’ and U.S. territories’ Centers for Independent Living; Parent Training and Information Centers; and Protection and Advocacy organizations—to provide technical assistance to those affected and the organizations serving them. Despite the Trump administration’s concerted campaign to hinder the scientific community’s efforts, the growing concerns and focus around climate change and ensuing extreme weather events are warranted and vital as the United States inevitably heads toward another hurricane season. In the 12 years since Hurricane Katrina pummeled the Gulf Coast, Louisiana and Mississippi have not fully or equitably recovered. This represents an ominous and frustrating foreshadowing of Puerto Rico and the U.S. Virgin Islands’ long road to recovery given their pre- and postdisaster parallels to the two Katrina-affected states: aging and vulnerable infrastructure; struggling economies; mass exodus of residents with the means and health to move to the U.S. mainland; and the disproportionate permanent displacement of families of color who cannot afford to return. The nation has had more than a decade to learn from and, more importantly, prevent the dangerous government missteps that continue to plague Katrina survivors, despite their resiliency. And yet, the same avoidable trauma and public health crises—particularly for families living in poverty and other marginalized populations—are currently unfolding in both Puerto Rico and the U.S. Virgin Islands.On the heels of Congress’ recent passage of dedicated disaster relief funding, it is critical that federal agencies continue the work of helping Puerto Rico and the U.S. Virgin Islands rebuild. But it is no longer sufficient or prudent to simply build communities back to their previous state, especially when their prior foundation was unsound and at-risk. Instead, the recovery goal must always be to build stronger and better in ways that make all communities healthier and more equitable, accessible, and resilient. The most reliable research warns that this type of extreme weather and its ensuing devastation will likely become more common as climate change creates the conditions for more frequent and intense storms. Each year, 230,000 U.S. residents can expect to be internally displaced, due in large part to tropical cyclones. Communities of color—which tend to be disproportionately marginalized and located in areas with poor infrastructure—are most at-risk during extreme weather events. It’s time policymakers learn from these disasters by rethinking how they safeguard, fortify, and sustain communities in disaster-prone areas. A crucial component of this rethinking must be a redesign of the nation’s disaster relief approach in order to better support these communities through the compounded, reverberating trauma that follows. Let’s ensure that 12 years from now, the devastating mistakes made after Katrina—and now Irma and Maria—are not repeated. Rejane Frederick is an associate director for the Poverty to Prosperity Program at the Center for American Progress. Cristina Novoa is a policy analyst for Early Childhood at the Center.